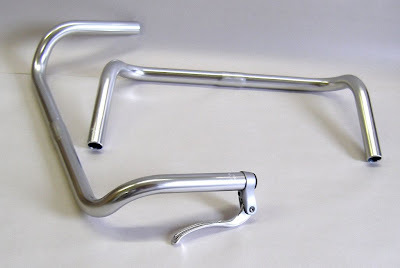 We just recieved another shipment of the VO/Nitto Montmarte and the Left Bank handlebars. They sold out very quickly last time we got some and it takes 4-6 months to have more made, so don't wait too long if you want a pair. I wrote more about them in this post. 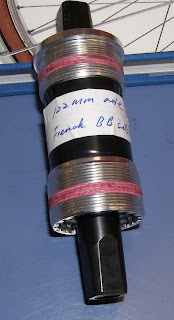 The photo on the left is of a prototype VO French thread bottom bracket. 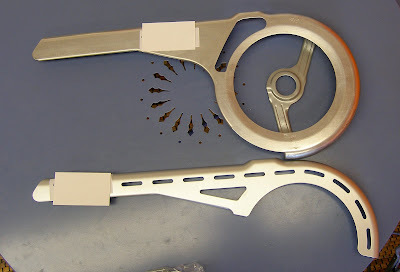 Back in the day, nations thought it obligatory to have their own standards for bike parts. There were French, Swiss, Italian, British, and even American standards for certain components. The British standard overtook the others and is what we see on almost all bikes today, but there are still many fine frames that require Italian (those are still made). French, or Swiss bottom brackets. So we're looking into having some made. Please don't ask when you can order one. I don't yet know if they will be produced; we're still trying to make this project feasible. What that means is that we need to get some shops or other wholesalers to commit to buying part of the production. We would have them in 110mm, 116mm, and 122mm. There is a possibility of a Swiss version too. We recieved the final fabric samples for the new VO handlebar, and other, bags yesterday. It is a thick finely woven cotton that appears to be amazingly waterproof. The manufacturer described it as waxed, but it does not feel overly waxy. The color is jet black. It exceeds my expectation. This was the last step before production. We still hope to see them in January. The ring locks should be here next month. Finally, Velo Orange will be closed on Thursday and Friday for the Thanksgiving Day holiday. For our overseas friends, this is a holiday that celebrates America's bounty. Most Americans spend it with extended family preparing and eating a stuffed turkey that's only slightly smaller than a Hummer. The following day is traditionally spent waddling about and shopping. At our house we'll be having family over for dinner, oysters (local, Chesapeake Bay) duck confit, pommes sarladaise, rum baba, etc. The following day may see a trip to the beach. Are any of you doing, or eating, anything exciting for the holidays? We went to the National Air and Space Museum yesterday. While Alec, our 9-year old, wanted to see space ships and rockets, I was fascinated by the Wright brother's creation, their bicycles that is. 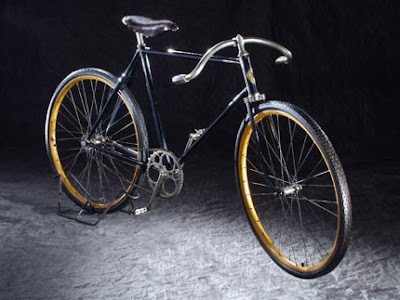 As you probably know, prior to building the first flying machine, the Wright brothers built bicycles. The model on display seemed amazingly modern and ridable, though it might benefit from a VO saddle and seat post. Bikes certainly haven't changed as much as airplanes. We also went inside the Skylab space station. I noticed the exercise bike used by the astronauts to stave off the muscles loss caused by a zero-gravity environment. 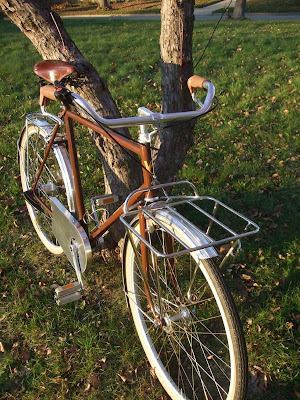 It had handlebars that look surprisingly like the upcoming Velo Orange Belleville handlebars. Even NASA is influenced by the French constructeurs. Perhaps we're a bit obsessed with product samples. It gets pretty expensive having all this stuff FedExed from every corner of the world, but the idea is that we'll find great products that no one else imports, or great factories to make our products. 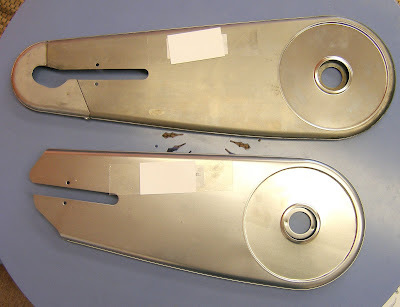 Here are a few sample chain guards from Europe that we recently ordered. Tom has been madly fitting these to various bikes. In this case, results have been less than promising. The top model works with a 52t, or smaller, big chain ring and, at least in theory, a front derailleur. The lower one does too, but I don't like the slots. What we find with the upper model is that it doesn't work well with many modern cranks. 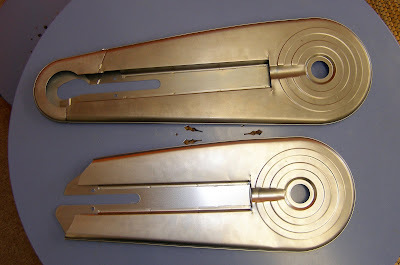 These guards are designed for the sort of crank where the arm sits on the spider, not the modern type where the spider seems to flow out of the arm. 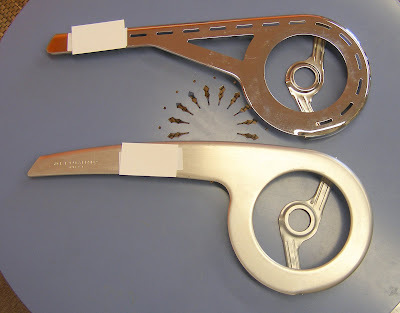 Here we have a chrome and an anodized model for single chain rings, but at $50 they may be a bit too dear. On the other hand, the full circle does a great job of protecting your cuff. What do you think of these? These steel chain cases are neat. 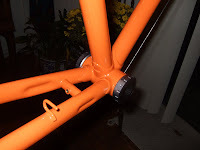 They must be painted and will fit only certain cranks on certain bikes. The thing that looks like a huge washer pops out for installation. And yes, they are closed on the back. I get a migraine just thinking about technical support for these. The two models below offer the best hope. At around $25 they are priced right. The top model will work with a 46t big ring and a triple crank according to the manufacturer, but getting it lined up exactly right is difficult. The bottom version is for single speeds and internally geared hubs. It's actually shaped like half a tube, so it covers the chain on both sides. It's steel, but pretty light. All of these are made for European city bikes with very long chain stays. We would have to have shorter versions to fit the sort of bikes Americans ride. I don't know yet what the costs and minimum quantities would be if we commissioned shorter versions. I came upon these two bike related photos while surfing aimlessly at 5:00am. They are from the highly regarded The Satorialist site. 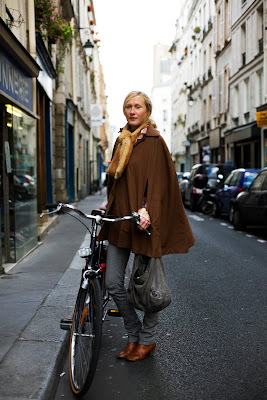 Why are Parisians so elegant? Take this Lady, despite being strangled by a blond rat she just oozes style. 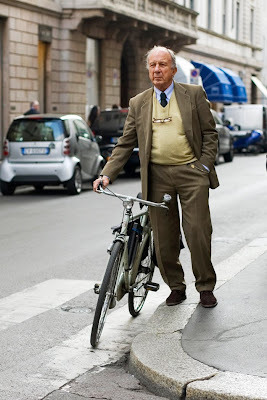 And this fellow from Milan is me in a few years (if only). We've been considering making some larger VO saddlebags. 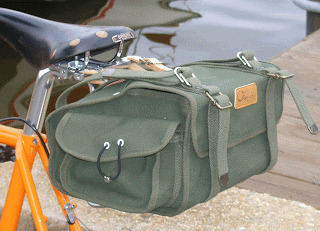 We currently sell five models of saddle bags. The first two are the small Brooks Challenge a D-shaped bags, these are small bags for tools, keys, or other small items. We also sell the VO Croissant and Baguette bags which will soon be available in a new style in black and with more leather trim. These bags are the perfect size to leave on a bike all the time; there is room for tools, wallet, mini-pump, a banana, a rain shell. Finally we have the Ostrich bags which approaches the practical size limit for saddle bags. This size bag is useful for the commuter and for short inn-to-inn tours. So what do we want in a VO saddle bag? We want a larger bag that matches the look of the upcoming VO handlebar bag and new versions of the Croissant and Baguette bags. That is it will be black waxed cotton with brown leather trim. We also want it to be sturdy and reasonably priced. Finally, Carradice bags are almost impossible to get these days and it's time someone filled that gap. As for size, Both Tom and I own Carradice Longflap bags. I think that that model is simply too big; Tom uses his every day. We both agree that there is a practical weight limit for saddle bags that is too often exceeded. I think it's 5-6 pounds; Tom says about 10 pounds. In any case, we agree that an overloaded saddle bag severely and negatively effects a bikes handling. If your plan is to go grocery shopping, panniers, not a large saddle bag, are what you need. So something of about 8 to 10-liter capacity is what we're after. As for shape, I prefer a more square shape like the Berthoud and Ostrich bags. A saddlebag this big really needs to be used with a support such as the ViVa support or the Bagman support (are those still made?) The square shape is better suited to use with a support and better suited to laptops, books, and other loads that are often carried in saddle bags. Tom argues that the round shape with expandable collar offers more capacity, perhaps too much capacity. So we'll open the floor to discussion. What would you like a larger VO saddle bag to look like? 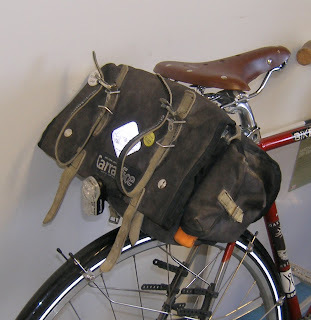 Speaking of bags, we just listed three interesting panniers on E-bay, still working to get rid of lots of samples and display items. My old company sells an amazingly comfortable kayak seat that I'd named the "Happy Bottom Pad". I was so tickled by that name that when I sold the company I reserved the right to use it in future. But my plans for a VO Happy Bottom Saddle have come to naught. My staff thinks the name is too stupid and I've been talked out of it. Nonetheless, these are very very comfortable saddles. At 205mm they are wide enough for even the most ample of bottoms and absolutely luxurious for the svelte behind. They are sprung so one's stately composure is not compromised by even the most potholed of lanes. 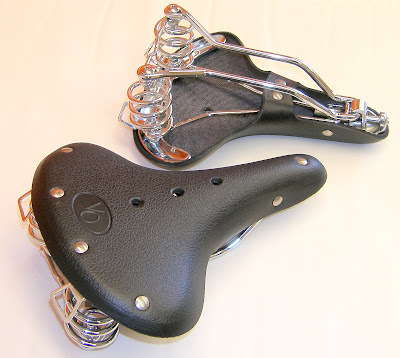 Of course these are saddles for sitting upright on a proper city bike with high handlebars, not for racing about. As for their weight, well that's a bit like money, not something we talk about in polite society. There are actually two different models. The black ones are Model 7 and have the skirts folded in and riveted to prevent splaying. 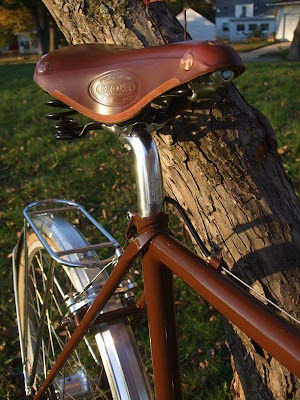 The Model 8 saddles are brown and have an old-fashioned tie to rein in the skirts. We'll see which system our customers prefer. Otherwise they are identical. As with our other saddles, they are made from the finest Australian cow hide with an anti-stretch layer laminated underneath. The frames are chrome plated steel. 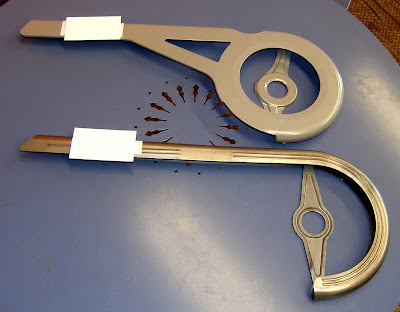 Bag loops are standard and tension adjustment is via the included Allen wrench. At $85 they are not an unreasonable indulgence. I ordered these as soon as I saw them at Eurobike. 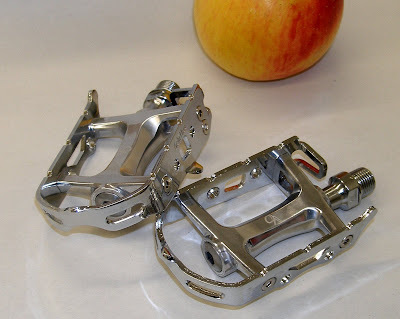 These are stunning pedals. 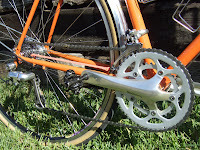 By now you've noticed the chrome plated cages, reminiscent of very old Campy pedals. Pretty! But on second thought chrome cages must weigh ton. How about 267g per pair, and that's two entire pedals, not just the cages. The secret is that these are chrome plated aluminum alloy, not steel. They are made by the clever folks at Wellgo in Taiwan. As usual we had a Velo Orange version created. First off we specified high quality sealed cartridge bearing for long life and no maintenance. They are very smooth. We also asked for alloy, not plastic, dust caps. 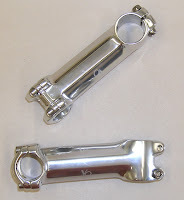 The pedal bodies are polished, in the VO tradition. And the VO logo is discrete. With a 96mm x 60mm cage they are a perfect size for most folks. And at $49 there is no reason to get a loose bearing road pedal. We Just got a big shipment of VO components and accessories that we've been having difficulty keeping in stock. We have more VO Grand Cru seat posts. We have gotten so many e-mails asking when these will be available again! VO handlebar water bottle cage mounts are back. We have all sizes of VO bottom brackets back in stock. 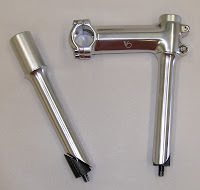 VO stem adapters are also available again. And VO Model 6 saddles in brown and black came in. 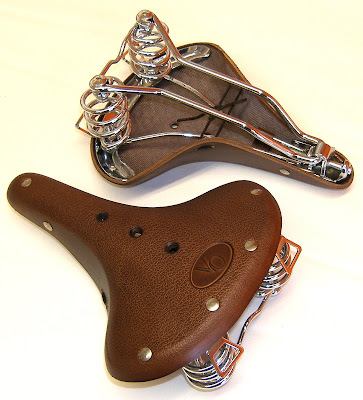 Plus we have new VO city bike saddles and a really beautiful new pedal. I'll post about those after taking some photos. We've had a couple of ideas. The first is to import a stainless steel rack that's being made in Taiwan. 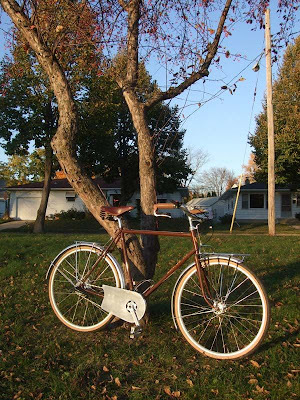 This is not a Velo Orange design, in fact it looks similar to, and perhaps even nicer than, a certain Tubus model. It's made of stainless steel with a mat finish. The quality is pretty darn good and it's very sturdy. There are pump pegs for a short pump. And all the hardware is very very nice. The price would be under $100, perhaps under $90. 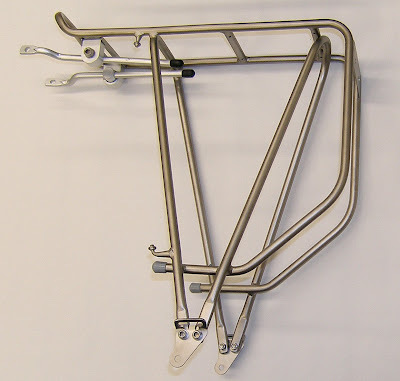 I think that there are many folks who would like a stainless steel rear rack that's bigger than the VO Constructuer racks and suited to larger panniers and bigger loads. I'm just starting work on a larger VO rack design, but it won't be ready for 6-10 months. In the meantime do you think there's interest in this rack? Another idea is importing ring locks. Ring locks are tremendously popular in Europe. 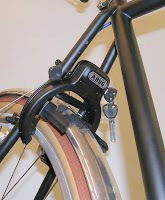 They are bolted or clamped to the seat stays of a city bike and lock the rear wheel through the spokes. They provide an almost instant way to lock your bike. Of course they won't do much good in New York city, but in many towns they are all you need. What I like about them is that they stay on the bike. The key can even stay in the lock in some models. So when you run into a shop a simple flick of a locking lever prevents the casual thief from riding off on your bike. For longer stops you can run a cable around a fixed object and lock it in the ring lock. There are dozens of ring locks made for the European and Asian markets, but they are almost impossible to find in the USA. 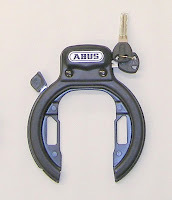 Ring locks are available in both basic and high end models. We're thinking of importing of importing a mid range model, $20-$25, but not necessarily the model pictured. Any interest? 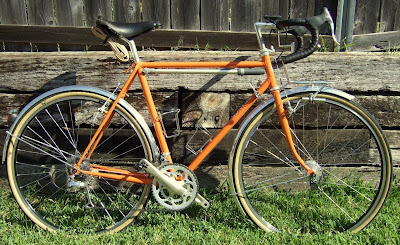 George was kind enough to forward some photos of his brand new Velo Orange Rando bike. This is really a nice build. And very cool lights! I’m very happy with how it turned out and took it out for a little spin to Paris last Saturday. That’s Paris, TX, of course for a distance of 300 Km. The bike rode like a dream. Best ride on chip seal pavement I’ve ever had. Corners beautifully and good stable ride with the front bag installed. Much less soreness than my previous long distance bike – and that’s with the same Grand Bois tires. 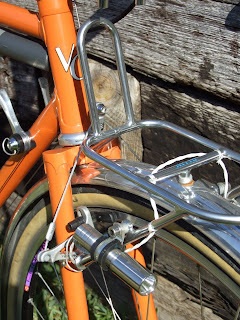 Here, for your viewing pleasure, are a few photos of the latest VO Gentleman bike . The frame is fillet brazed and assembled by Ahren Rogers. The drive train uses a SA 5-speed hub and a Nervar 50.4mm BCD crank; Pablo found the pedals. 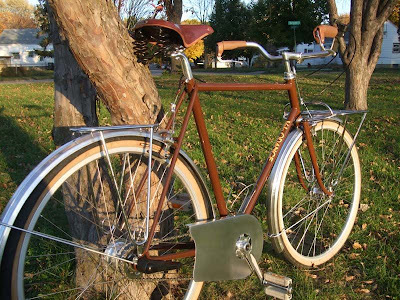 The fenders, chain case, bars, etc, are all from Velo Orange. The front rack is custom. This is, in short, a true constructeur bicycle. I think Pablo will enjoy this elegant machine.